Fathom Events, New Line Cinema, Metro-Goldwyn-Mayer Pictures and Warner Bros. Pictures will present all three extended editions of The Hobbit Trilogy across a three-night theatrical event, featuring The Hobbit: An Unexpected Journey on Monday, October 5; The Hobbit: The Desolation of Smaug on Wednesday, October 7; and The Hobbit: The Battle of the Five Armies on Tuesday, October 13. Each of the features will play at 7:30 p.m. local time. This is the first time that the extended editions have been shown in movie theaters, including the never-before-seen extended edition of The Hobbit: The Battle of the Five Armies. In addition to the events, there will be a special on-screen introduction from the Trilogy’s director, co-screenwriter and producer Peter Jackson. 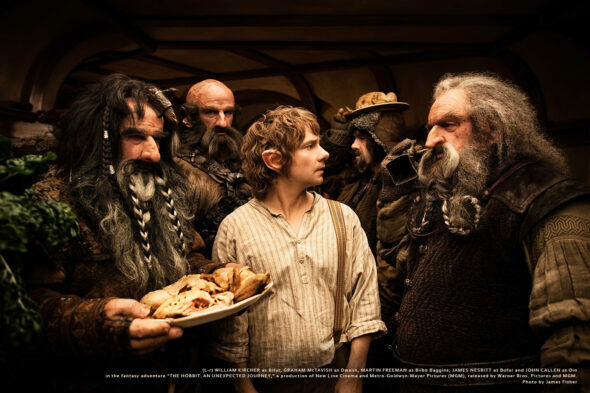 Tickets for The Hobbit Trilogy are now on sale and can be purchased online by visiting www.FathomEvents.com, or at participating theater box offices. Fans throughout the U.S. will be able to enjoy the event in more than 500 movie theaters. For a complete list of theater locations visit the Fathom Events website (theaters and participants are subject to change).